One Year Anniversary for OTTB Leader Board! 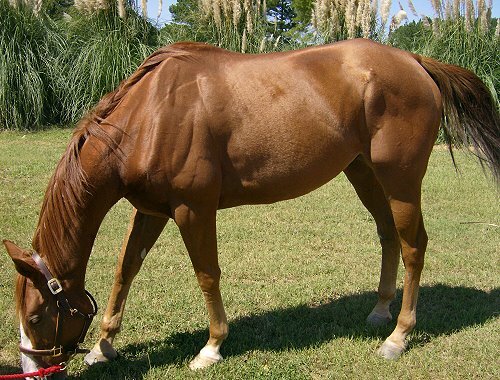 Leader Board was purchased as a Prospect Horse For Sale directly from the race track - sight unseen by Melissa Hopkins one year ago in September 2008. I just wanted to give you an update on Leader (Leader Board) since we have hit our year anniversary. He is still as great as ever. We are really working on suppleness and balancing now. He has been such a blessing for me. We had what I considered one of the nicest compliments yet. My trainer said that even of we looked at 50 horses he couldn’t have found a better match than Leader for me. Sadly, our trainer moved. Leader has now moved out to my personal barn. He has transitioned so well with no hiccups to note. We are in the process of finding a new trainer in our area so we don’t lose everything we have worked for. Let me know if you have any recommendations in the Augusta area. On a side note, my husband has started to come around again to the idea of another horse. We are not quite ready yet though. I think we will probably wait to closer the the new year. I will try to send picture soon, but I think the last time I sent them they did not go through. I will try again!